eQMr solution has been designed with a vision of enabling healthcare systems deliver the highest quality care through electronic supervision of proper documentation and compliance with quality standards, rules and regulations. Utilizing eQMr reduces the incidence of avoidable human medical errors and thereby save lives and reduce patient suffering. eQMr aims to become a world´s leading solution for quality care management in the healthcare industry. "Medical errors kill enough people to fill four jumbo jets a week…" Marty Makary, Wall Street Journal, 9/22/12.There have been many other similar publications emphasizing the immediate need to rectify this gruesome situation. The following statement says it all: "If medical errors were a disease, they would be the sixth leading cause of death in America- just behind accidents and ahead of Alzheimer”.We, the co-founders of eQMr, believe that our system provides one of the needed solutions. eQMr is a spin-off of KDE Group, one of the leading system houses for IT Governs, BI and LIMS in Israel. The main mission of eQMr is to enable an easy and smooth compliance with theJoint Commission International (JCI)Standards and other International Accreditation Schemes as deemed necessary for hospitals’ accreditation and its maintenance. 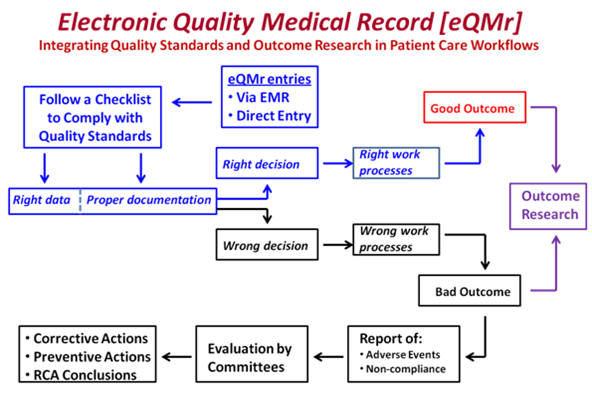 The system enables real-time reports of adverse events, noncompliance with standards, rules and regulations, and provides an efficient platform for implementing preventive actions, corrective actions, root cause analyses (RCA) and outcome research.eQMr fosters healthcare systems’ commitments to relentless pursuit of quality improvement and quality culture with transparency, collaboration and integration across all healthcare disciplines. eQMr enables care providers a quick access to a library of quality documents pertaining to JCI accreditation and the healthcare organization´s own requirements. These include, but are not limited to: Policies, Procedures, Guidelines, Mandatory courses, Committees work, Ongoing quality projects, CAPA conclusions, RCA conclusions and Outcome measures. eQMr provides an efficient platform for reporting adverse events (AE) and non-compliance that are based on JCI standards and measures as well as the Institute of Medicine (IOM) six aims of quality. The platform channels all reported events to specific administration units (committees) and subsequently distributes responses to the reported events. eQMr uses tools for effective management of preventive/corrective actions (CAPA) and Root Cause Analyses (RCA). eQMr also serves as a portal to outcome research and quality projects using Six Sigma tools and statistics.